When you have children and become a parent, you definitely don’t have to stop doing things that you did before. One of those things in particular is travel. There can be a bit of an idea that your wanderlust and travels has to stop when you’ve got a baby. But travel with children can be a really rewarding thing to do, as there are some amazing memories that you can make, as well as fun experiences that you can all do together. It isn’t always easy, and will be different to what you are used to, but it can most certainly be done. 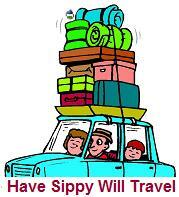 One of the biggest stressors when traveling with a baby is that you want your baby to be healthy when you are away. The thought of having to visit a doctor or a hospital when you’re in a place that you don’t know, or where you don’t speak the language, can be stressful and not something that you want to do. 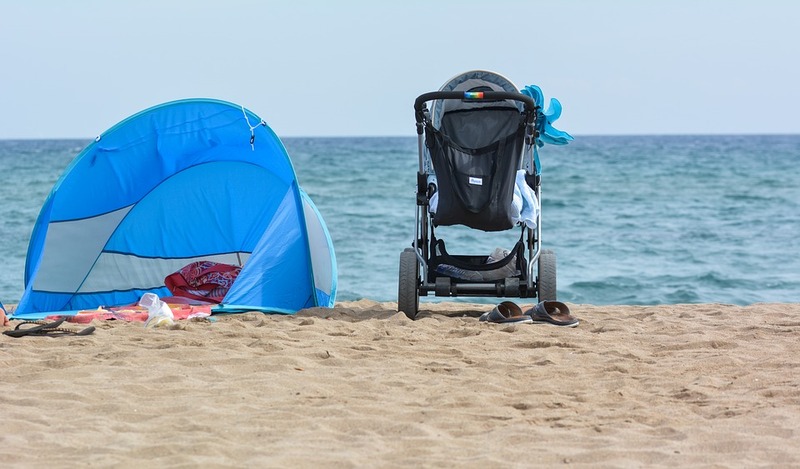 So making sure that you are able to keep your baby well on your trip is such a good idea, to make sure that you can have the best trip possible. With all of that in mind, here are a few ideas and tips to help you be prepared and keep baby healthy and well when you travel. If you are unsure about anything before you travel, then speaking to your doctor or pediatrician is a really good idea. It could be a good idea to talk about your travel plans, as well as checking on things like vaccinations, especially if your baby is young. 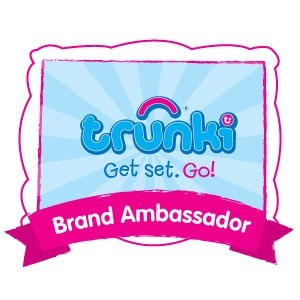 Sites like this one could also help if you’re looking for information about vaccinations and travel with young children: https://www.fitfortravel.com/general-travel-health-advice/child-travellers. Your doctor might even give you some suggestions to keep your baby healthy as you go and travel. You all know that finding items that you love when you have a baby or older children is incredibly important. I absolutely love this seat. It is a great way to get your baby up and working on those tummy muscles as well as having them be more a part of the classroom. 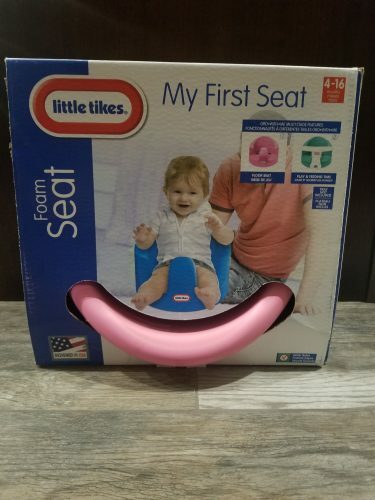 My First Seat features wide 3.5 inch openings, a wide seat area and tall supportive back to ensure baby is comfortable, supported and that the seat will fit baby as they grow. 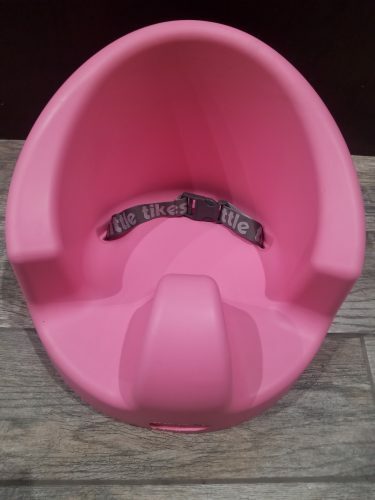 Careful design considerations were made to ensure that the floor seat would fit infants and babies of all sizes and features some of the largest supportive areas for back, legs, and seat on the market. 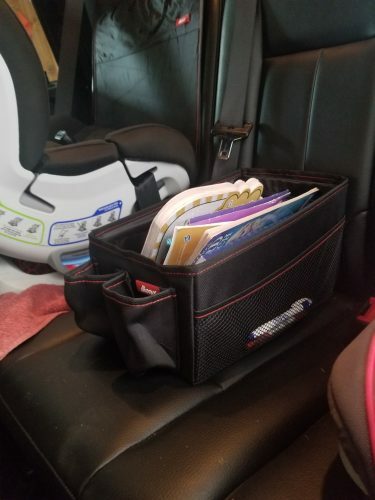 Everyone knows that when you have kids, it is almost impossible to keep your vehicle tidy, especially if you are constantly on the go. 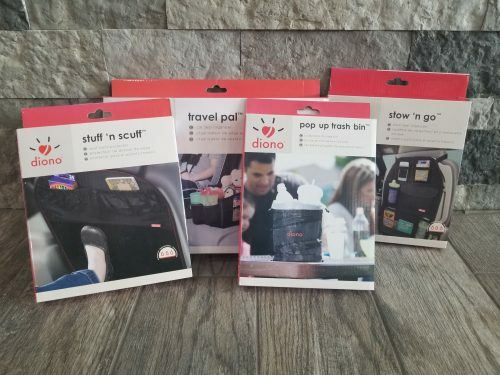 These great products from Diono are must haves to make sure that you are nice and organized for all those summer road trips! This Trash Bin is so simple, but incedibly effective. The Pop-Up Trash Bin is a versatile, mutliuse smart and clever 3-ni-1. The essential additional storae you never knew you needed, for those days on the go. Thoughtfully constructed to be compact and flat-collapsing, the drawstring top keeps belongings or trash secure from falling out on the journey. 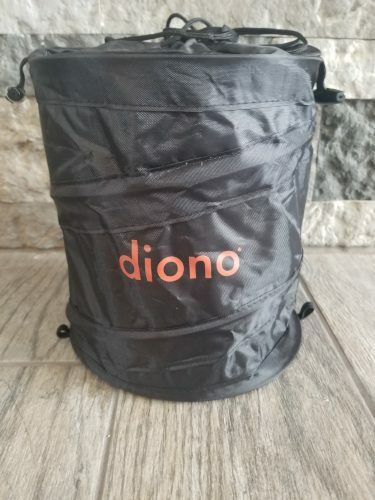 The Diono Travel Pal is the friendly in-car storage solution. For traveling toys, bring-a-long books, snacks or cool drinks, the Travel Pal has plenty of space to make the journey fly by. There are multi-pockets for all your needs, and with super hand insulated drink pockets for keeping drinks cool for longer. Parents will do anything within their powers to protect their children from harm. Right? Right! So, if we protect our children from … say for instance … mosquitoes or harmful UV rays … shouldn’t we also protect their precious hearing? Of course, that is why I was happy to let my one-year-old nephew try out the Lucid Audio’s HearMuffs. Growing ears of babies and toddlers are susceptible to damage. Providing hearing protection, especially at a young age, helps to ensure optimal he aring as your child grows. 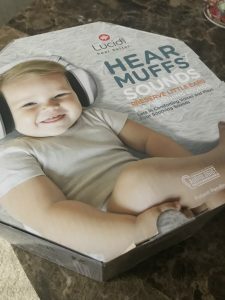 HearMuffs is a protective devise that is tauted as being the most advanced hearing preservation for infants and toddlers! Sounds great, but does it work? I used the HearMuffs at a recent Track-n-Field event where there is historically a large amount of screaming by parents who are trying to encourage their competing children … and not to mention the sudden pop of the starter’s pistol at various times. Unexpected sounds or aggressive voices startles my youngster … which leads to a crying … which leads to crankiness .. which leads to the me leaving earlier thank expected from an event. By his reactions, it is clear loud noises hurt. 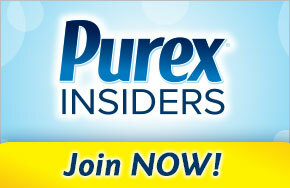 Did you know that May is skin-cancer awareness month? I think it’s perfect timing since summer is here and everyone is spending every moment outside. Skin cancer is something that I honestly never really thought about until the past few years. I have naturally tanned skin and dark hair so when it comes to sun burns I never really worried much. My husband; however, is pale skinned with red hair. It’s the complete opposite for him. Even if he is outside for an hour he has to have sunblock on or he will come in looking like a tomato. 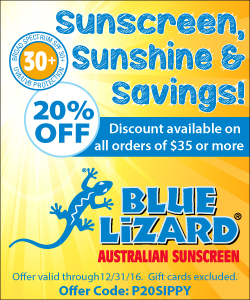 Having four kids, half of whom have inherited my dark hair, but a lighter skin complication like my husband, has made me more aware of skin cancer and of making sure their skin is protected from all outside elements. Babyganics has every product that I need to make sure they are protected from the summer elements, and can continue to have fun! 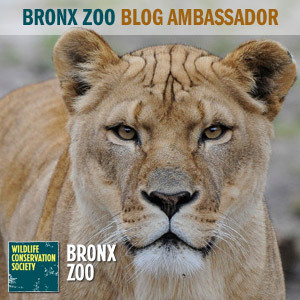 This post is a sponsored post, but all opinions, stories, and my experience are all personal and true (like always)! It’s true that no matter how old the kid you always want to have one eye on them for when they need you. After a certain age that gets to be impossible, but at no time is it more important than when they are helpless in their crib. 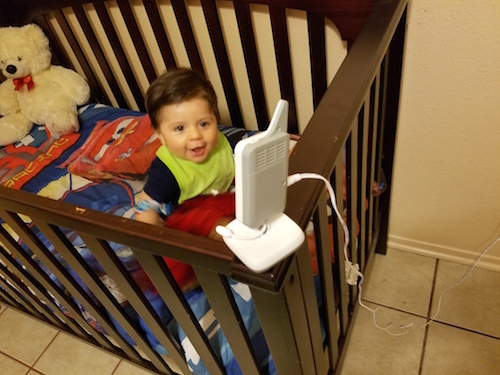 You want to have the tools to keep them safe and a baby monitor is high on the list of important gear for a young child. BBlüv’s Viziö has everything you could want, an all in one package to offer peace of mind. The Viziö digital video baby monitor lets you peek in day or night without disturbing your nap time or nightly sleep. 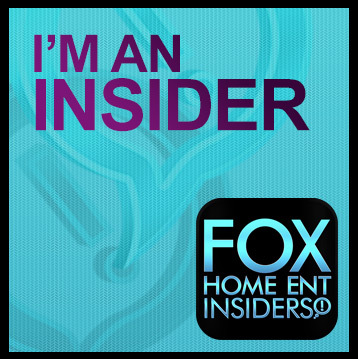 The built in microphone allows you to hear everything that is going on, while the speaker allows you to communicate. As your child gets older you can chat back and forth easily without standing right there in the room so this is not an item you out grow in a short time. A high quality monitor is a good investment. When you think of hammocks beautiful beaches may come to mind, or lazy afternoons in the backyard, perhaps thoughts of camping in the woods. Shopping carts are unlikely to be your first association, but Binxy Baby may change that. The shopping cart hammock takes your next visit to the store from hassle to harmony. Keeping your baby safe and comfortable is absolutely the goal with any product you are purchasing. Functionality and easy use are also key and the Binxy Baby Shopping Cart Hammock has all of that. 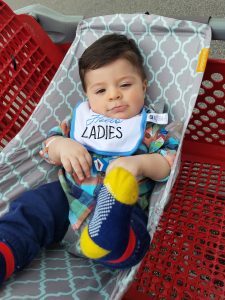 Basically this high quality two layer fabric hammock is designed to clip onto the sides of a shopping cart so you can strap your munchkin in for a secure ride. If you want to use your carseat instead of placing the baby directly in the hammock that works too. In fact it is the safe way to have a carseat mounted onto a shopping cart, just use the strap that comes with it. Carry your kiddo in style and comfort. Nothing is more important than your baby’s health and having the ability to keep your little one close and safe is a wonderful thing. 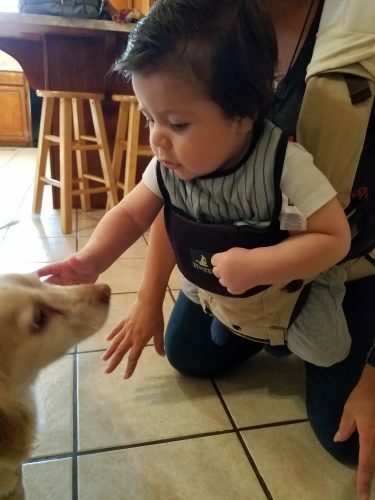 Abbie’s Huggs Contour Baby Carrier is an innovative carrier designed to prevent infant hip dysplasia while offering a booster seat that is comfortable for the carrier and carry-e. This lightweight carrier, just 2.2 lbs (1.0 kg), is made of 100% cotton and 100% polyester mesh. The fabric feels strong and firm yet soft and smooth so it won’t irritate soft baby skin. It comes in two color options, a nice grey or neutral khaki. Either looks great and if you want to add some style you can always make it a craft project to individualize your Huggs. All of the buttons clip nicely and have a strong hold so the carrier feels secure. The Abiie’s Huggs Contour’s is special in its design because it focuses on preventing hip dysplasia. This may be something you have heard discussed before for babies or adults, heck it is a common point of discussion amongst pet owners because it can effect us all. In hip dysplasia “the top of the thighbone doesn’t fit securely into the hip socket. This problem may affect one or both hip joints.” – WebMD This is of course uncomfortable and can go so far as complete dislocation. 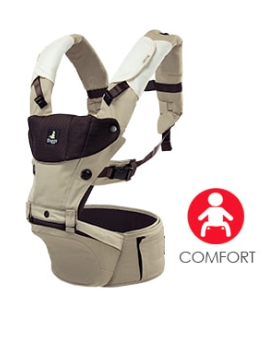 So with that concern why not embrace a carrier that keeps the kiddo “ergonomically seated in a healthy hip position”?